The Perseus X4 and Aurora X5 boosters are just about ready for their next missions. Aurora Booster “Omnia” has been readied for its planned December 11th mission to test out a night flasher / lighting system under flight conditions. We will NOT be launching at night, but testing to verify that the electronics can survive the forces associated with launch & recovery conditions. There is one more scheduled flight test of the system before we clear it for our first night launch sometime in the summer of 2011. Speaking of the Aurora X5 booster, Aurora X5 booster # 002 is under construction. As of right now, it has no name. The construction is slightly different from X5 booster #1 (Omnia). One of the changes will allow us to fly Aerotech F35 motors. This should give the ability to reach an altitude of nearly 2,000 Feet. Aurora X5 booster #002 after fins have been released from the fin setting jig. Perseus booster “Eagle” is also ready for flight to test a side mounted camera system on December 11, 2010. The plan is to fly on an Aerotech F-24 motor over Harmon Field – weather & winds permitting. Artemis booster “Garfield” is in standby to test some “Anti-Zippering” options. We are actually considering using a modified Estes Tomahawk kit for these tests as well. We will make a decision by Wednesday. Looking ahead, the next launch for us will be in Feburary 2011 when we flight test our dual deployment altimeter system using the new Aurora X5 booster. No dual deployment flights are planned, only a dry run to test the responsiveness of the avionics during the various stages of flight. 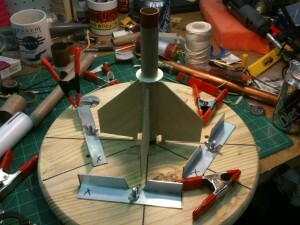 This will be done by installing buzzers in place of the igniters that will be used to deploy the parachutes. The on-board camera will be used to record not only the position of the booster during the events, but to also capture the sounds of the buzzers at these moments. This data will be studied, and used to plan our first high altitude dual deployment with X5-02 booster using the F35 motor in spring 2011 at the Skybusters Amherst field. Lots of other exciting things to come! Stay tuned!